This charming house that sleeps 12 + baby has been listed “3 Clévacances” by the tourist office of Lot-et-Garonne (approval number LGC194). The renovation will be completed in early 2015. The house is South-exposed on the plateau de Marcoux on a lit 4000 m² park bordered by a laurustinus hedge and wooden gates. The property is secluded and surrounded by set-aside lands with exceptional views of the countryside over 10 km (you can see Bourg-de-Visa). At the rear of the park, there is a large very modern private lit sea salt 12x6 m pool with stairs at the end and jet stream secured by a solar slatted cover as well as wooden gates. It is surrounded by a large lit 100 m² terrace that is linked via a path to another 40 m² terrace (that can be covered with a solar awning) that leads to the kitchen via double French doors. The 2 terraces and the path are tiled with reconstructed stones and lit by lamps and spotlights. In front of the house, a pavement with lit riser and a 3rd 15 m² terrace lead to the kitchen. The property is well lit both at the front and at the rear. 2 extra lanterns at the entrance of the property switch on when you arrive as well as the lighting of the riser to ensure comfort and safety of our guests when they come back late at night. The 11x3 m boules ground is located at the front in the park which gives you the opportunity to play boules while enjoying an aperitif and preparing the dinner outside (large charcoal built-in barbecue and electric plancha by the large table under the acacias). There is a very well fitted sports-fitness-relaxing room with electric darts, table tennis table and table football table. The charm of traditional style mixed with modern comfort, oak beams, old open fireplaces (1 with insert in the living room) and period oak cupboards. Living room with insert that you can use in the old open fireplace, old oak beams, 2 sofas and 3 armchairs, LED flat screen television, landline phone, Wi-Fi Internet, DVD player, hi-fi system, safe and small stylish pieces of furniture. The 5 bedrooms are spacious and the bedding is new. The 2 bedrooms on the ground floor are tiled and those on the first floor have parquet floor. These bedrooms have their own style. The “Fleurs de Lys” bedroom with private shower room located on the ground floor has a lot of charm with its old fireplace, its old oak beams and its 2 original cupboards (the door and the window open onto the front park), the “Roses de Redouté” bedroom on the ground floor with private bathroom has a bed in an alcove, a sofa and an original cupboard. On the first floor, there is a Mezzanine with yellow and blue tones, 2x90 cm beds and baby cot and a “Vintage” bedroom (the one in the middle) with “Mode” screens. A shower room is shared between these 2 bedrooms. At the back, there is a large 50 m² double bedroom in a more Provencal style with private shower room, 140 cm bed, 120 cm bed and 90 cm bed. By the large salt pool, there is a Spa (for 3 people: 2 sitting and 1 lying) on the large terrace that is linked to the terrace at the rear of the kitchen (with shower room at the end of the terrace). It can be covered by a solar awning. A tiled path links these 2 terraces. Large outdoor swing set with hut for the pleasure of children: 3 swings (1 for baby), climbing ladders and slide as well as small tables, seats and games). For teenagers: soccer, badminton, volley-ball, basket-ball, speed badminton and some board games. This house is particularly pleasant in summer: very cool thanks to its thick walls that are a natural air-conditioning system. Bedrooms are very pleasant both on the first floor and ground floor where the skylights at the rear bring some brightness and ventilation. This 4000 m² property is a haven of peace far away from the town. You can hear the song of the birds, cicadas and frogs. It is limited by a 3-m laurustinus hedge at the rear and on the sides and a wooden fence at the front. A plants screen (conifers and bushes) obstructs the view from the small path. Many tree, bush and flower species in the park: lime, bay laurel, bay tree, laurustinus, robinia umbraculifera, sumac, red maple, albizia, lilac, mock-orange, summer lilac, hibiscus, cedar, rose bush, rose-bay, lavender, box tree, rosemary, mint, thuja, stone pine, etc. as well as many flowers. I have a Master of Mathematics and I speak 3 languages. My oldest daughter is an economist and she works in a trust in Luxembourg. My younger daughter is a teacher at the University of Anvers where she teaches statistics and probabilities. We have been taken not only with the region (also called French Tuscany) but also with the house (typical Quercy style with old fireplaces, oak beams and cupboards), the large park planted with flowers and trees, the environment and the location that is pretty heavenly. The house has been fully renovated by mixing the charm of traditional style with modern comfort. It is a holiday house to get together with the family. Most of the inhabitants are English. It is the gastronomic region of France (great wines, local cuisine and gourmet markets) and the mild climate is very pleasant and easily bearable. There are many cultural visits. It is an ideal starting point to visit Aquitaine and Midi-Pyrénées. The house is located at the edge of Périgord, Quercy and Gascogne. The large park is flowered all year round and great trees offer many shaded areas much appreciated when the weather is hot. Its surface area of 4000 m² offers space for everyone. The old house is very cool and pleasant in summer. This property purchased in 1997 has been fully renovated and modernised over the years and everything will be completed in early 2015. You can see many pictures of the property and the region on our personal website. Egea Spa and rear terrace that can be covered with a large solar awning (with remote control) to protect yourself from the sun. Large heat-resistant stone and brick barbecue to cook grilled meats and bake pizzas or bread Large cedar swing set for the delight of children Large very modern lit sea salt pool surrounded by a large terrace (that is linked to another terrace at the rear of the house) and secured by a solar slatted cover purchased in 2009. A boules ground and a relaxing-fitness room have been fitted in 2014 The bedding has just been changed, the bedrooms are tiled or have parquet floor (no carpet) and all bathrooms have been modernised (2 extra bathrooms with shower, washbasin and toilet in 2015). This place is a true paradise: seclusion, quietness, comfort, space and exceptional views of the countryside (you can see Bourg-de-Visa 10 km away). The property is surrounded by set-aside lands. You can hear the song of the birds, cicadas and crickets. In spring you can hear the frog cawing in the small ponds and you can also see small hares and hinds in the surrounding fields. The small country lane in front of the house has very little traffic: only local traffic (around 10 secluded houses on the plateau de Marcoux) so you can safely have a stroll without being disturbed by a car. Quietness, comfort and relaxation far away from the daily noise and stress. There is a large bathroom that has been renovated in 2012 with washing machine, tumble dryer, modern shower, bath, bidet, toilet and washbasin. Bathrooms are brand new or fully renovated. There is a hair dryer in each bathroom. There are 2 shower rooms with shower, washbasin and toilet including a rear outdoor shower at the end of the terrace by the pool with very modern shower (and fold-up seat for the safety of elderly people or children). This shower room has been renovated in 2012. The shower room on the first floor is equipped with modern hydromassage shower and has been renovated in October 2013. 2 extra shower rooms in 2015: 1 for the bedroom on the ground floor (the one with open fireplace) and 1 for the large back bedroom on the first floor. They both have a shower, a washbasin, a toilet and a heated towel rail. There is a hair dryer in each indoor shower room. All bathrooms have been modernised. Gas and electric and electric plancha as well as heat-resistant stone and brick built-in barbecue with fireplace to cook grilled meats and bake pizzas and bread. Electric as well as built-in barbecue with extractor hood to cook grilled meats and bake pizzas and bread. More than 100 free channels from different European and non-European countries but no paying channels such as Canal Plus, etc. Board games and chessboard Basketball, volleyball, badminton and speed badminton, soccer goal and ball, boules, table tennis and electronic darts. Sandbox and giant hopscotch game. 4000 m² lit park planted with trees and flowers and closed with laurustinus hedge and wooden fences. 3 terraces: large 106 m² terrace surrounding the pool and linked to the second 40 m² terrace at the rear of the kitchen (access via French door) and 3rd one linked to the kitchen at the front. Very modern pool and Spa-Jacuzzi Electric heating and insert in the living room All bathrooms are new or have been renovated Fully fitted kitchen: toaster, Nespresso and Dolce Gusto coffee machines, electric kettle in addition to the percolator, squeezer, ice crusher, coolers, pressure cooker and CD radio. 12 deck chairs, large table, 5 round tables, 24 garden seats, charcoal barbecue and huge electric 90x40 cm plancha. In the living room: satellite LED television (150 channels) with decoder, working insert, landline phone, DVD player, Livebox (broadband Internet), safe, hi-fi system and board games. You can play boules in the park and there is a swing set for children (slide, swings, ladder, hut, etc.) A well-behaved pet can be accepted with prior agreement of the owner There are 5 spacious and tastefully decorated bedrooms with new bedding There is a 2nd television with video recorder on the first floor. Propriété magnifique et temps super! A recommander sans hésiter! Super séjour entre couples d'amis dans une belle propriété bien entretenue. La maison est bien aménagée avec des suites et super équipée, tout le confort moderne associé au charme d'une belle maison du 18e située dans un grand parc bien éclairé. Notre 4ième séjour à La Rouquette s’est déroulé, tout comme les précédents, sans aucun nuage (en ce qui concerne le temps, qui a été très agréable en ce mois de septembre 2018 (entre 26 et 32 degrés), et la maison et ses équipements). Malgré les pièces en enfilade de cette magnifique longère, nous avons tous notre intimité (4 des 5 chambres disposent d’une salle de bain privée). Après un arrêt obligatoire chez notre boucher préféré le dimanche matin au marché de Roquecor, nous avons passé 5 jours de farniente bien mérités à La Rouquette, sans pour autant nous ennuyer (entre superbe piscine éclairée (dont le liner a été changé en 2018), spa, barbecue, pétanque, salle de sport, ballades à vélo,… il y en a pour tous les goûts!). Les nouvelles baudruches pour s’amuser dans la piscine, dont le superbe flamand rose, nous ont valu quelques fous rires ! Nous avons ensuite pris la route direction le bassin d’Arcachon où nous avons séjourné sur la presque île du Cap Ferret (à 250 km de la Rouquette) afin de profiter de l’air de l’Atlantique pendant 4 jours. Entre dégustations d’huîtres au bord de l’eau à l’apéritif chez les ostréiculteurs (je recommande particulièrement les 2 adresses suivantes : Huîtres Eric Larrarte dans le magnifique et typique village Le Canon et Chez Boulan au Cap Ferret), ballade en pinasse, dune du Pilat, île aux oiseaux et les fameuses cabanes tchanquées ainsi qu’un tour gourmand sur le bassin, accompagnés d’Alain, un local très sympathique, qui nous a fait découvrir à pied les endroits secrets de la presque île (villages de L’Herbe et du Canon principalement), qui a comblé nos yeux comme nos papilles, nous n’avons pas vu le temps passer. Nous sommes ensuite repartis direction Marcoux pour terminer notre séjour et nous relaxer au calme à La Rouquette. Farniente, visites et farniente sont les mots d’ordre de nos vacances dans cette très belle région qui offre de nombreuses possibilités d’excursions. Nous tenons à remercier la propriétaire qui est toujours disponible par téléphone et à notre écoute. Nous pensons déjà à réserver 2 semaines pour l’année prochaine et qui sait, passer quelques jours dans le pays basque français. Retourner à La Rouquette est, pour nous, synonyme de vacances réussies ! Merci pour votre appréciation ainsi que pour nous avoir informés, que par des températures proches de 40°C durant la journée, il fait chaud dans les chambres de l'étage. Nous allons apporter une solution supplémentaire à celle existante, nous avons pris immédiatement des informations auprès d'amis du sud-est de la France qui y ont séjourné la semaine précédente et ceux-ci nous ont conseillé d'ajouter des stores placés à l'extérieur sur les vélux pour apporter une solution en période de canicule, principalement dans la mezzanine, chambre dans laquelle les vélux sont plus grands, les larges murs étant moins hauts et absorbent donc moins la chaleur que ceux des autres chambres. Une isolation supplémentaire du plafond par l'intérieur de cette pièce pourrait aussi être envisagée. Certes, durant cette semaine du 28 juillet au 4 août, il a fait très chaud, plus chaud que d'habitude, les températures dépassent rarement les 35°C, la température moyenne en journée est de 30°C en juillet-août. Ce sera avec grand plaisir que nous vous y accueillerons pour d'autres vacances et vous y trouverez une habitation encore améliorée, le confort de nos vacanciers étant notre priorité. Encore merci de nous avoir fait cette remarque, cela nous permet d'augmenter la qualité de notre location, ce qui est notre soucis premier de propriétaires. Nous avons profité de la piscine qui n'est pas chlorée et des extérieurs très bien aménagés, bien ombragés ce qui est appréciable pendant cette période bien chaude. La nuit on a pu profiter du ciel étoilé. Belle maison ancienne, très bien restaurée, de la place et tout ce qu'il faut. Dans les villages alentours nombreux marchés et animations, du bon vin aussi. En résumé, très bel endroit à recommander. L'endroit, la région, la gastronomie, l'acceuil..
A notre arrivée, nous avons été très bien accueillis par Hazel, la gardienne, qui nous a ouvert la porte et nous avait préparé le repas pour le soir... quel bonheur après cette longue route de ne pas à avoir à se soucier de cuisiner et de pouvoir profiter directement de la grande piscine régénérée au sel de mer, chauffée et éclairée et du spa! Le boulodrome et le parc éclairés sont parfaits pour prolonger les soirées tout en partageant des moments festifs (entre amis pour notre part mais certainement très agréables également en famille) . Très bons restaurants dans la région (dont trois étoilés à moins de 30 km) recommandés par la propriétaire. Mais il y en a pour tous les goûts... qui se refuserait un succulent cassoulet de canard fait maison avec un bon verre de vin? Je recommande fortement le marché du dimanche matin à Roquecor (à 5 km); petit marché mais... croyez moi le boucher mérite vraiment le détour... viande très tendre, à faire fondre tous les palais! Les locaux sont très accueillants... et que dire des Anglais qui s'y sont installés... so funny people! Mes amis et moi y avons passé une très belle semaine; semaine faite de découvertes de cette très belle région (Toulouse et Saint Emilion pour notre part), de farniente, de gastronomie et surtout une semaine remplie de bonne humeur. Nous avons un seul regret: ne pas avoir réservé deux semaines mais nous y remédierons bientôt! Un grand merci de notre part à tous à la propriétaire qui est toujours joignable par téléphone et de bons conseils. Endroit magnifique, bien au calme. Ce fut un moment merveilleux dans la région gastronomique de France où les visites sont nombreuses et très diversifiées. Accommodation listed “3 clés” (2013) sleeps 12 + 1 baby with lit private sea salt pool and 4000 m² park fenced with a laurustinus hedge. This typical house from Quercy dating from 1744 has been fully renovated while mixing the charm of the traditional style with modern comfort. It is secluded on the South-exposed plateau overlooking the beautiful countryside. It is protected by an alarm system. The 12x6 m sea salt pool is secured by a solar slatted cover and surrounded by 100 m² terrace linked by a tiled path to the 30 m² terrace (solar awning with remote control) located at the rear of the kitchen that gives access to a 3rd lit and tiled terrace at the front of the house. The house is protected by an alarm system. There is a Spa Jacuzzi with massage jets and chromotherapy. Relaxation, games, sport and fitness. 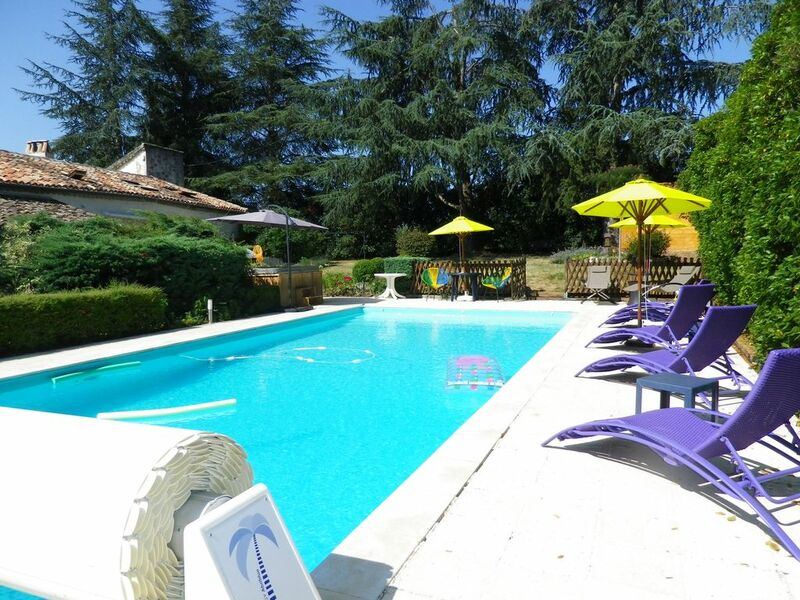 Other activities: walks, bike rides or horse rides (Domaine de Lauzinie is 5 km away), hikes, lake with all water sports in Montaigu-de-Quercy 10 km away and 2 lakes in Beauville, 1 for fishing and 1 for swimming and Disneyland to the South-West 30 km away. Many visits are possible. Ideally located at the edge of Aquitaine, Périgord and Quercy, there is a wide choice of visits in several departments: Lot-et-Garonne, Gers, Landes de Gascogne, Lot, Tarn-et-Garonne, Dordogne, Gironde and Haute-Garonne. In Tarn-et-Garonne: Moissac with the most beautiful cloister in the world and its 12th century abbey-church which Last Judgement Tympanum inspired Umberto Ecco in “The Name of the Rose”, the Canal du Midi, Lauzerte and the Way of Saint James. In Lot-et-Garonne: Agen, Villeneuve-sur-Lot, Monflanquin, Penne-d'Agenais, Bastides de l'Agenais, Château des Comtes de Duras, Château de Bonaguil (Cathar) and Château de Nérac (King Henry IV). In Landes de Gascogne: the Arcachon Bay, the Dune of Pilat and the Atlantic Ocean with its beautiful sandy beaches. In Gironde: the town of Bordeaux, the famous vineyards of the Bordelais (Graves, Sauternes and its famous Château d’Yquem, Saint-Emilion, Côtes de Bordeaux, Côtes de Blaye, Entre-deux-Mers and Haut-Médoc) and the estuary of Gironde as well as the confluence of the Garonne and the Dordogne. In Lot: Cahors, the Bas-Quercy, the famous Pont Valentré, the Lot Valley and its famous sites of Saint-Cirq-Lapopie (listed most beautiful village of France, the second one is Saint-Guilhem-le-Désert) and Rocamadour (second most visited site in France after the Mont Saint-Michel), the Padirac Cave and the Pech Merle Cave, the Haut Quercy and Figeac (the town of Champollion with its “Espace Patrimoine” dedicated to Egyptology, Champollion Museum with the writings of the world: the Grand-Place is covered with hieroglyphs) as well as the Lacave Caves. In Dordogne: the Dordogne Valley with its castles and picturesque villages such as Beaulieu-sur-Dordogne, La Roque-Gageac, Castelnau-Bretenoux, Lacave and Castelnaud, the famous Château des Milandes (that used to be the property of Josephine Baker) and Beynac-et-Cazenac. In Périgord Noir: the town of Sarlat-la-Canéda, the Vézère, the Lascaux Caves (the Sistine Chapel of Prehistory) and the facsimile Lascaux II, Les Eyzies-de-Tayac-Sireuil which is the capital of the prehistory (Cro-Magnon Man), caves and museums from the Palaeolithic period, the Jardins Suspendus de Marqueyssac, the Château de Commarque (troglodyte base overlooked by Roman structures, a fortified area in an exceptional environment). Périgueux and the Périgord Blanc, Bergerac and the Périgord Pourpre (Château de Hautefort and Château de Monbazillac) and the Périgord Vert and Brantôme (the Venice of the Périgord nestled in a meander of the Dronne). The South-West is the gastronomic region of France with its great wines, magret de canard with leg of duck confit, foie gras, lambs, farm chicken and duck, truffles and ceps, goat cheese without forgetting the Rocamadour and Cabécou, the desserts (walnut tart, prune pie and Agen prune), the vin de noix liqueur (nut wine) and pear or plum eau de vie without forgetting fruits and vegetables). There are gourmet markets almost every day within a 15-km radius maximum (on Tuesday in Bourg-de-Visa, on Wednesday in Saint-Maurin, on Thursday in Lauzerte, on Friday in Beauville and on Saturday in Puymirol): in this way, you can discover the cuisine and the wines offered by local producers in a festive atmosphere (orchestra, dances and tombola) and in settings dating from Middle Ages. Le ménage final et la location des draps de lit , soit 200€/séjour, sont inclus dans le prix demandé du 01/05 au 30/09 ainsi que la taxe de séjour de 1,95% du prix de la location qui doit être versée à l'Office du Tourisme du Pays de Serres. Nous limitons le nombre d'adultes à un maximum de 8 et nous pouvons accueillir de 4 enfants ou 5 enfants si ceux-ci sont en bas âge ainsi que 1 ou 2 bébés. Une assurance peut être souscrite et incluse dans le prix demandé ( annulation ou séjour écouté pour cause de deuil d' un proche, d'un accident d'une maladie ou d'une opération, ou d'une perte d'emploi ou autre drame familial) celle-ci sera souscrite auprès de cléassur via clévacances à la demande du vacancier ( le maximum pour une semaine est de 100€ en THS ,le prix est dégressif en fonction de la saison : 3,5% du prix à payer) .